Being used to the heat and humidity in Asia, I knew I could handle a scorching summer-load of boundless sunshine. What I didn’t know was how the weather was sometimes disagreeable with my body from Vienna to Budapest on flat roads when we were cycling the Danube path. I was mistaken when I thought coasting on flat roads meant cruising at a leisure place, but it still required constant pedaling. I imagined slowing down in anticipation of stops, slowdowns, and downhills where you can go faster getting into a position to rest your legs but that’s not quite what had happened. I assume no reasonable bicycle tourer would object unless there’s an uphill slog in these brutal temperatures. To add watercooler to our senses, we passed by charming and beautiful towns and some very obscure ones, while crossing the capitals of these three countries Vienna (Austria), Bratislava (Slovakia) and Budapest (Hungary) in a week covering approximately 310km. We could have done it faster but we simply wanted a relaxed pace. One that required a lot of stops at the supermarket chugging on that delicious European fresh milk and having copious amount of Frankfurter Würstl. I apologise in advance for the slight detour. Comfort food fills me with joy. That was our constant sustenance. Austrians love their sausages and are fiercely proud of their homegrown wurst. Served between a soft baguette, dipped in horseradish sauce paired with an Austrian beer, promises not to disappoint. Starting out, we rented our bicycles from Vienna Explorers for a pretty good deal and made our booking in advance since it was “peak travelling season in EU”. For 200 euros covering rental, panniers and toolkit, you get to drop-off your bike at Budapest and don’t need to pay extra to transport it back or to lug your bike around. It was lovely starting the trip at the beautiful capital of Austria. Vienna is often called The City of Music, or the World’s Capital of Music, as more famous composers have lived here than in any other city in the world. Wolfgang Amadeus Mozart, Ludwig van Beethoven and Johann Straus are just a few who called Vienna home. I was on the flight with some interesting people from the Choir Technology Institute of Austria. I met software engineers and choir medalists under the ‘pop’ genre from a recent session in Cape Town South Africa. Who knew choir singing had genres? I thought it was only on the basis of vocal range. As a software engineer, the German lad in Vienna was doing his PhD on learning how to build software to use music manuscripts to teach people. It always fills me with inspiration and awe when I meet interesting folks who dabble in dual careers melding two of the best worlds to produce something unique. Perhaps one of the reasons why I like striking up conversations with people when I travel - you get an unfiltered view of people’s thoughts, unexpected careers and ideas. Gravelly dull scenery at times. This is when we decided to change it up and cycle across towns along the bicycle path and the highway. Riding on my trusty and heavy weighted KTM bicycle and wondering if this is really a bicycle path? We began riding through the scenic Vienna’s Prater, a beautiful stretch of lined-trees when we were cycling the Danube. We drifted into a meditative cycling state as the breeze offered us a variety of wildflowers, cool air and fresh grass. Each year, this path sees up to 600,000 cyclists with majority of those in July and August but we did not see many when starting out. Continuing on with our ride, we rode 69km on the first day until we reached Bratislava in Slovakia. There were no traces of the potent sun when we started, however, it poured mid-way and the temperature gradient varied. We had many stops and alternate routes but just as the evening sun was settling in, we stumbled upon a lovely castle in a green village called Eckartsau. Summer brings wonderful colours onto this Baroque mansion and I can only imagine what is it like in Autumn. The mansion belonged to the residence of Emperor Charles I of Austria, the last ruler of Austria-Hungary. Being in the center of the beautiful park, we rested on the freshly manicured grass, the warm breeze blowing gently on to the vast meadow. If you wanted to hold a wedding, this could probably be the place. Starting out in Vienna with the countryside in view. hammocks on the ground, green meadows and a light cool breeze.. Just what we need after cycling 42km. Coffee, cake and dreams of holding a beautiful celebration here some day. After a long and arduous journey, we finally made it to Slovakia. Passing through remnants of the old Soviet past, it was lovely to see the city which was once the capital of Hungary, Bratislava. The sunset beamed down passing an orange glow onto the cobbled lanes and streets. Scrambling through these cobbled stones was no ordinary feat, I dragged my bike up to the Old Town of Bratislava where my hostel was located - it was an ancient castle set in the 17th century and had an outdoor restaurant with the best views of the city. Winding down with some burgers and wine was in order for the next 24 hours! It was a rest day for us the following day and we aimed to get acquainted with the walking tours and understand more about this modest-sized city. The patchy execution of the infrastructure plans with a massive highway across the old-town appeared odd to us. Nevertheless, exoticism was in the air - there were a numbers of tourists (including us) who came to enjoy the compact city, baroque palaces, fairytale cobbled streets and affordable bars. “Us” pretty much after a cycling for a long time. 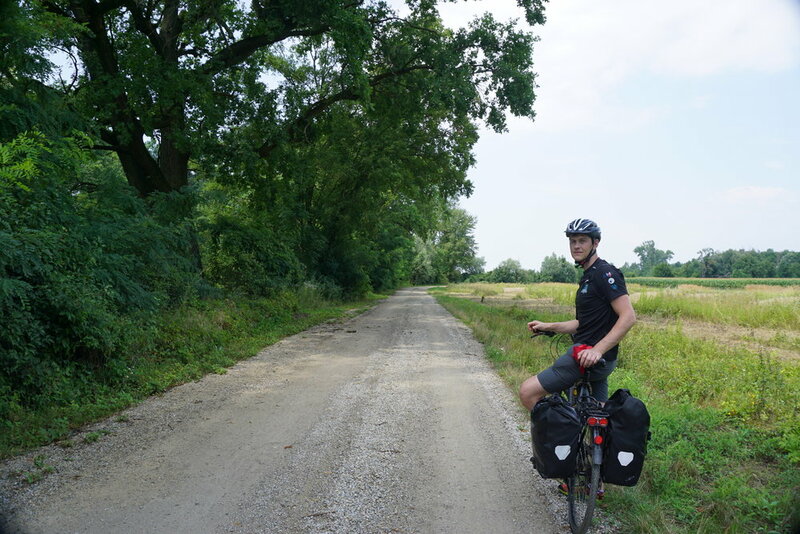 On our third day heading towards Hungary, with a total of 45km for this stretch, we were really feeling the heat after a late start and a heavy European breakfast. But, by afternoon we had glorious company and banter from cyclists around the world. We found great company with fellow bikers who had interesting backgrounds. A cool Argentinian teacher who teaches culture and linguistics in North Carolina, US and just decided to buy a second hand bike in Vienna and cycle head on to Budapest because why not? Another cyclist from Serbia who started his trip from Belgium all the way to home. He builds bicycles for the handicapped in Serbia. Reeling from inspiration, we continued on to Europe’s only dental town, Mosonmagyarovar for a lunch stop. It was weird to know that this was the place to be if you needed a dental crown. A Google search told us that Mosonmagyarovar has more dentists per capita than anywhere else in the world, and most of them work in dental tourism, as more than 160,000 Austrians come here for dental treatment every year. The beginning of newfound friendships. Just the bunch of us delighted to have met and bonded over life and travels. You won’t find a unique dental town like Mosonmagyarovar. From Mosonmagyarovar, we took a train to Gyor costing us 1260 forint (5USD). 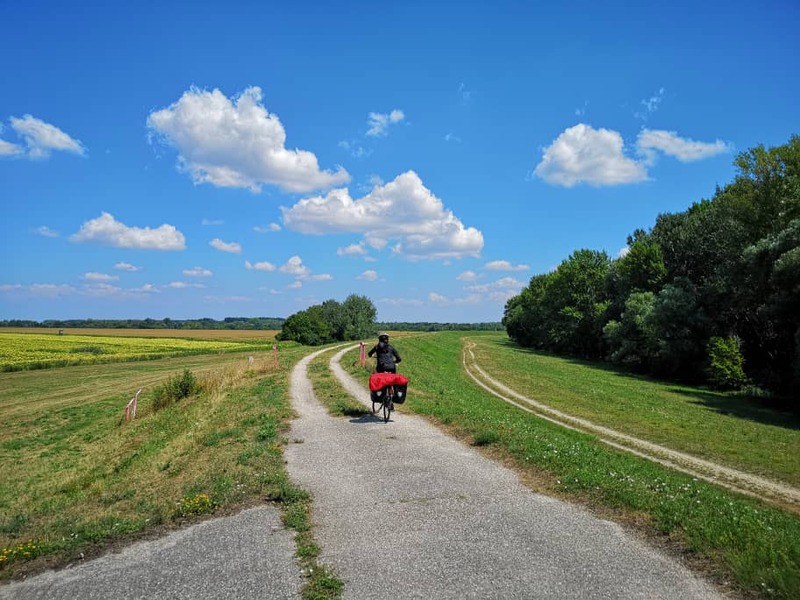 We had done our research and the cycling path towards Gyor was supposedly uninteresting and unpleasant - we wanted to save on time and energy to explore Gyor and savour some Hungarian ghoulash and langrosh, a deep fried dough. Continuing on with our cycling feats on the Danube path, the next day proved to be a challenge. After the bridge that crosses to Gyor, the quality of the path on the Slovakian side was a nightmare for about 40 to 50 km until Komarno. We faced uneven surfaces, gravel path with big loose rocks. It honestly felt like were on a dirt bike trail trying to perform some gravity defying stunts. While it was occasionally thrilling, it didn’t feel good when I fell and momentarily lost my GoPro bearings. Exhausted but not defeated, the next few days from Komarno to Esztergom and onwards to Domos brought forth hikes and explorations in the searing heat. Surrounded by old houses and palaces, Esztergom was described as Hungary’s Rome. Esztergom's massive basilica, sitting high above the town and Danube River, is an incredible sight, rising out of what seems like nowhere in a rural stretch of country. It was so hot that we just spent the entire day doing our laundry, having icy coke, heading to the supermarket, stocking up on watermelons, milk and breakfast goodies while playing an infamous travelling card game called ‘Shithead’ against some good old hits on our hosts ancient radio. You can say we truly enjoyed these simple times. “Seems like it!” - Cycling on the Hungarian side of Komarno. Nearing the end of our trip, we had a wonderful stay in Visegrad, a small town in pest country of Hungary. It offered one of the best views of the Danube bend and needless to say we spent the following morning hiking up to the castle to take the view in. Nature seem to dominate most of the places. The house that we stayed in was a perfect quaint attic and around us were overgrown gardens with little streams. Cycling through these roads were often a great opportunity to see the way the locals live. We got her on the bus and with limited time on our side, the two of us sped our way up till Budapest just in time for dinner and a shower in the very busy capital of Hungary. We rolled through wooded parks perched with churches and castles. There were a lot of cyclists ambling along with their tight lycra clad shorts. Some would ride at cracking pace, first on their ride out and then again later. I was heavily loaded with enough clothes to last me through the cycling in the Himalayan winter after this and that slowed me down. As we arrived, Budapest’s stunning Parliament building and pretty bridges greeted us and it was time to navigate the labyrinth of bicycle lanes, big highways and walking path. Suddenly, we lost the familiar Hungarian old towns as we left the river and join evening commuters and locals walking their dogs after a day in the office. I enjoyed the sight of reaching Budapest, truly mesmerized by the city’s energy. The world seemed poised to go somewhere and I now had some decisions to make - to make the most out of my night in Budapest or sleep-in. It was exciting but the heat had seeped all energy out of me. Feeling parched taught us the gratitude of running water and fluids in general. So we lived a little and our plans rapidly snowballed. We visited Sir Lancelot, a medieval themed restaurant where suits of armour greeted us at the door. The next few days in Budapest afforded a lot of time to walk around, and observe people who bought portable fans to keep themselves cool in the merciless heat. A bird’s eye view of the Danube bend.